This community college arts complex consists of a new 30,000 square foot building for fine arts programs, and an addition of dance studio, art gallery, and lobby to a 65,000-square foot performing arts facility. Linking the two buildings is a new “Arts Plaza” that provides outdoor venue opportunities for all the creative arts. The design solution allows building functions (art studios, classrooms, dance studios, art gallery, theatre) to be symbiotic with outdoor spaces (roof gardens and ground-level plazas), which enhances interactions among faculty, students and staff of the diverse arts programs. The Fine Arts Building was developed as a solution to complex site constraints and programmatic needs of the campus. 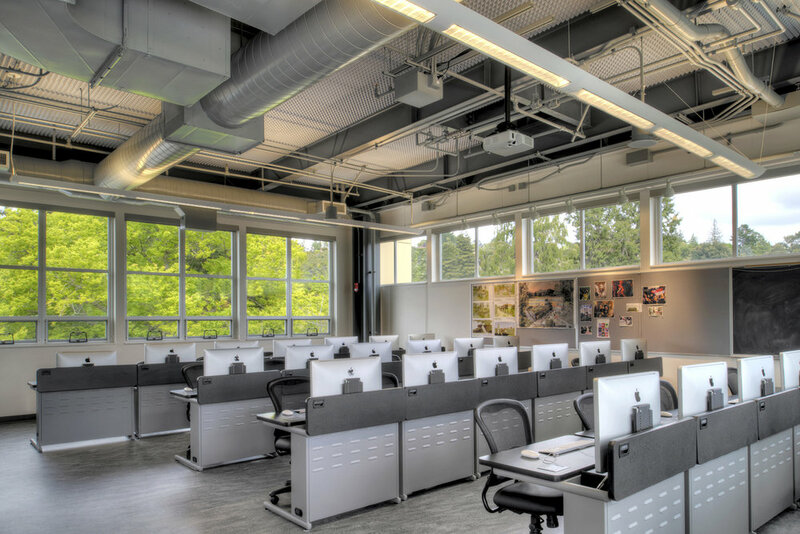 Daylighting determines the massing of the structure, with a single-story wing oriented north-south and crossed by a three-story bar of classrooms and studios. The building has two major elements: A ground floor indoor wing containing ceramics, sculpture, and jewelry studios, along with administrative departmental offices; and outdoor work courtyards for sculpture and ceramics. 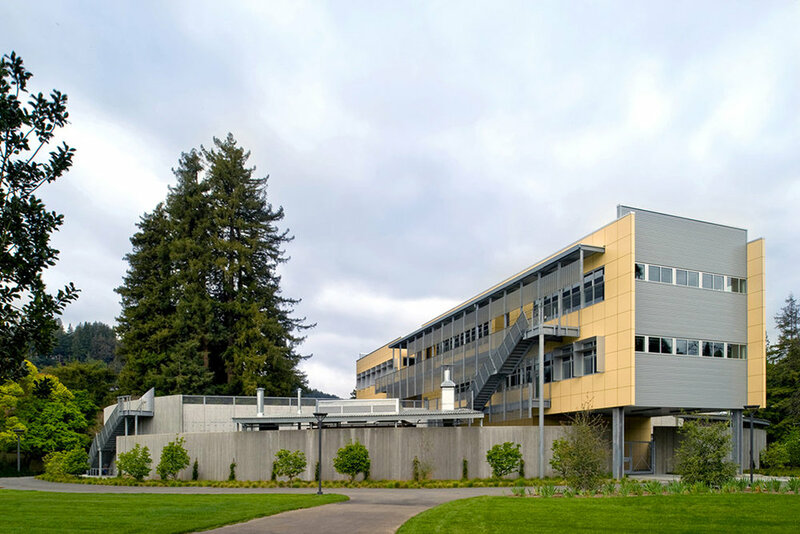 The arc of the concrete wall that defines the work yards is an important architectural and site planning element that geometrically mediates among neighboring buildings and the campus lawn. 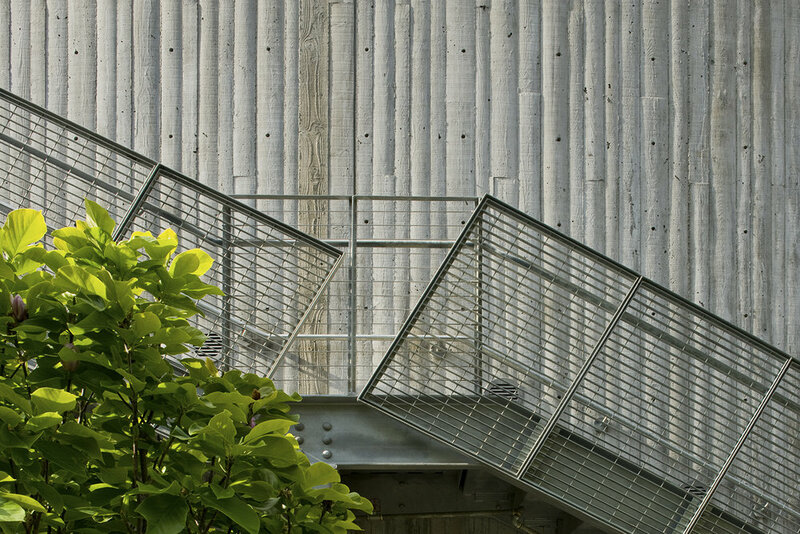 The roof of the ground floor studios provides a walking terrace for the second and third floors, and is planted as a ‘Living Roof’ -- an amenity that also yields sustainability benefits. The second and third floors contain spaces for drawing, painting, printmaking, design, architectural design studios as well as a lecture hall and a computer classroom. With ample day-lighting, the studios are well-lit and energy-saving, while exterior sunshades and optimal cross-ventilation moderate temperatures in the summer. 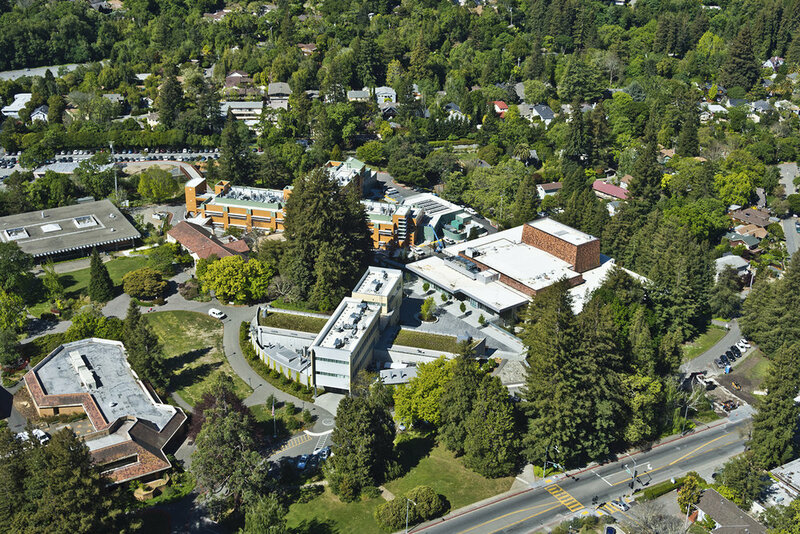 The building design takes advantage of the region’s mild temperatures, providing open-air walkways, and exploits vistas of the arboretum-like campus and the region’s iconic mountain. The LEED GOLD project features environmentally-friendly solutions for indoor air-quality, water efficiency, extensive passive sustainability strategies and reduction in energy costs and ecological impact. According to PG&E, its energy savings account is 21.7% better than the baseline.